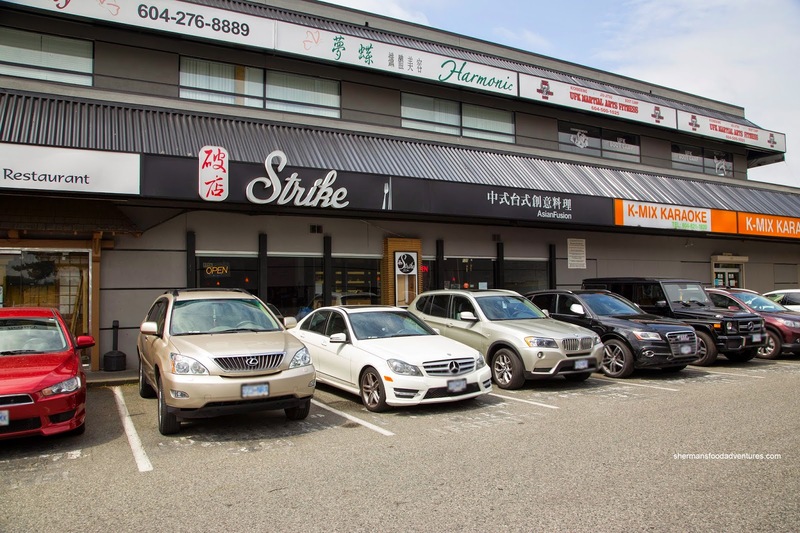 Out of nowhere, a new Taiwanese restaurant named Strike opened up nearly 2 years ago in Kitsilano. Interesting location, but really, not much competition. Back then, I sampled their wares via a ChineseBites tasting. Then shortly afterwards, another location replaced the defunct Chiffon restaurant. I was out-of-town when there was a tasting at this location, but I vowed to visit it one day. Over a year later, I still hadn't been to the place. Well, with an invite for a tasting, I finally got to see if it measured up to the original restaurant. We began our meal with the ever-popular Deep Fried Chicken Nuggets with fried basil and dusted with 5-spice. These were fairly large which helped keep the meat moist and juicy. With a firm crunch, the coating was well-seasoned and properly drained (as it wasn't greasy). Loved the ample fried basil as well. Onto something green, we had the Shredded Beef with Water Spinach in Taiwanese satay sauce. 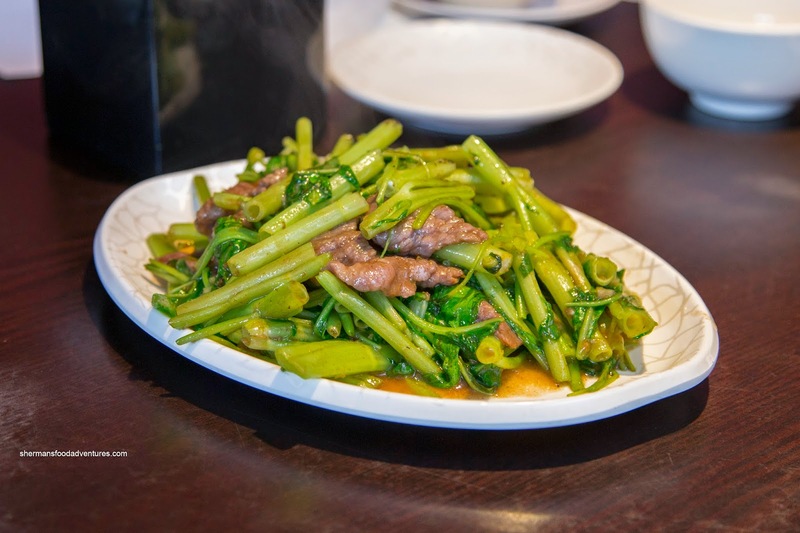 Usually, with this type of vegetable, if there is not enough wok heat, the dish tends to get very watery. As clearly shown in the picture, this was not the case here as there was only a minimal amount of moisture on the plate. 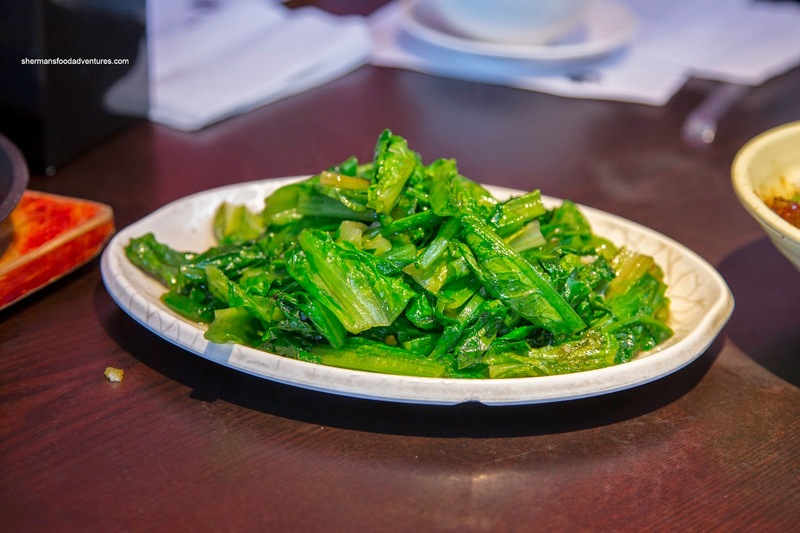 The ong choy itself featured crunchy hollow stalks which were amply seasoned with a background spice. Hidden within, the slices of beef were properly tenderized. Next up was the Spicy Pork Intestine Hot Pot with pickled mustard greens & pork blood. Although the portion size looked puny at first, the metal bowl was deceptively deep. Hence, there was quite a lot of fatty intestine to go along with the crunch of the mustard greens. The dish was sweet with a background spice. It was a tad greasy though. 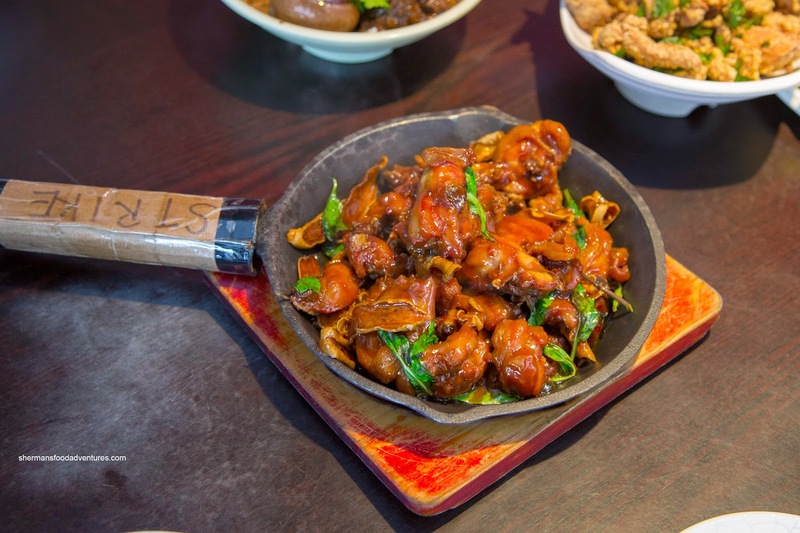 Of course we couldn't get out of there without sampling the Chicken with 3-Spice Sauce served sizzling in a cast iron pan. 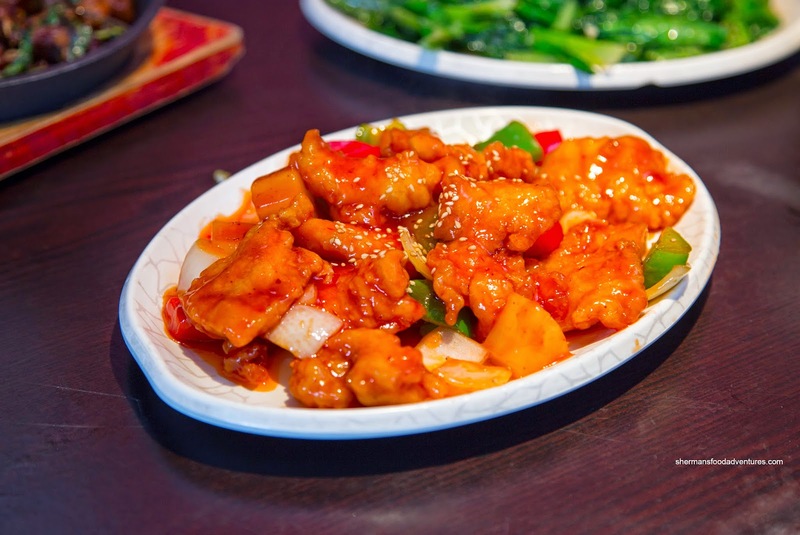 Loaded with ginger and a minimal amount of sauce, the dish was flavourful with Strike's twist of a touch of spiciness. As much as this dish was tasty, the chicken itself was a little dry from the deep-fry and could've benefited from more sauce. Onto more veggies, we were served the Sautéed Taiwanese A Choy. Similar to Romaine lettuce, yet with firmer leaves, the a choy was barely cooked. It retained a sweet crunch that was amply accented by a plethora of garlic. 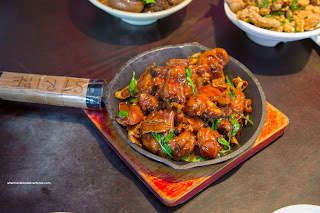 This dish was definitely the beneficiary of good wok heat as there was very little moisture left on the plate. Moving on, we next had the Sweet & Sour Fish Fillets with green and red peppers, onion and pineapple. This was a well-executed dish with moist and flaky fillets that were battered just enough. Moreover, there was just enough sauce to coat each piece without drowning the dish. 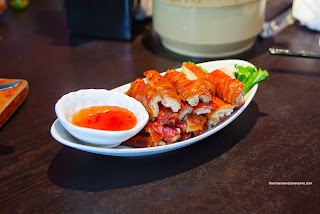 As for the flavour, the sauce had a noticeable acidity to go with the ample sweetness. So far, we had veggies and meat, but no carbs. But that all changed with the Braised Pork Rice with marinated egg, pickled mustard greens, pork fluff and cilantro. The bowl featured chewy (and not too wet) rice topped with tender braised pork belly. 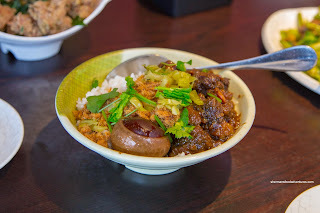 Thick, sweet and displaying layers of flavour (including the veritable 5-spice), the pork belly melted-in-my-mouth and easily flavoured the white rice. Similar to the chicken nuggets, the Deep Fried Squid Tentacles featured a firm crispy batter hit with the usual 5-spice. Also not very greasy, the firm crunch revealed tentacles that exhibited a snap-type rebound and appealing chewiness. 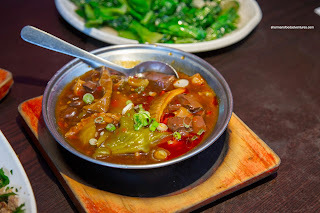 Our last dish was directly a result of my oohing and aahing for the intestine hot pot. 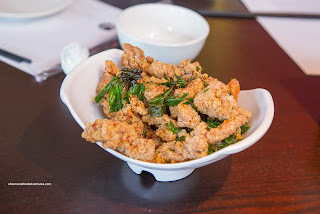 Yes, the Deep Fried Pork Intestines showed up and really, I had to eat it all because no one else wanted to. Not sure why because they were appealing in colour and texture. They were pretty plump with a soft, fatty interior. A touch chewy and gamy, this is what pork intestines are all about. 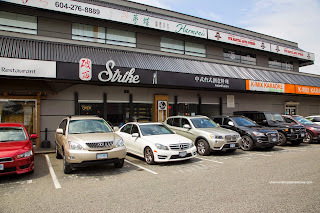 Much like my first visit to Strike in Vancouver, the meal here at Strike Richmond was solid. 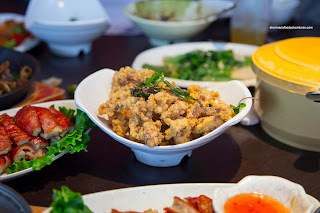 Dishes were mostly on point and the recipient of good wok heat and/or properly heated oil for deep frying.